This is important work from the Oakland Institute. Important for the future of sustainable farming in Africa and around the world. Oakland, CA: Concurrent with the release of a printed report, Voices From Africa: African Farmers & Environmentalists Speak Out Against Against a New Green Revolution in Africa, the Oakland Institute has launched Voices from Africa, a new online clearinghouse to share information on and promote alternatives to the New Green Revolution in Africa. Featuring articles, press releases, commentary, and reports from African NGOs and partner organizations and individuals around the world, Voices from Africa is set up as an interactive web community and will also serve as a resource for media and policy makers to hear the perspective of the African civil society groups on plans for a New Green Revolution in Africa. Using open-source content management, the website allows visitors to create a personal account and post new articles and information, comment on posted articles, and discuss topics of interest in the user forums. It is hoped that the community aspect of the website will enable activists from across the globe to link up and share news and updates from the latest campaigns against GMOs and will also function as a “home base” where stakeholders can forge coordinated strategy for fostering food sovereignty and influencing policy discussions. 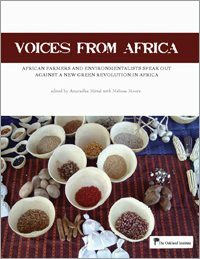 At launch time, the website content consists of the articles in the Voices From Africa: African Farmers & Environmentalists Speak Out Against Against a New Green Revolution in Africa, and new articles that have been received following publication of the report, as well as biographical and contact information for each author. The website also has links to each organization featured in the report. By providing links to partner organizations and enabling users to post content and participate in building the Voices from Africa community, it is hoped that the website will provide a platform to voices often ignored and allow them to be heard in the ongoing policy battle surrounding the new gene revolution in Africa. Visit Voices From Africa at www.oaklandinstitute.org/voicesfromafrica and join today to bring your voice to the debate.